Physics Buzz: Let Go, Tarzan! Hiroyuki Shima, a physicist from the University of Yamanashi in Japan, posted his foray into Tarzan physics earlier this week. 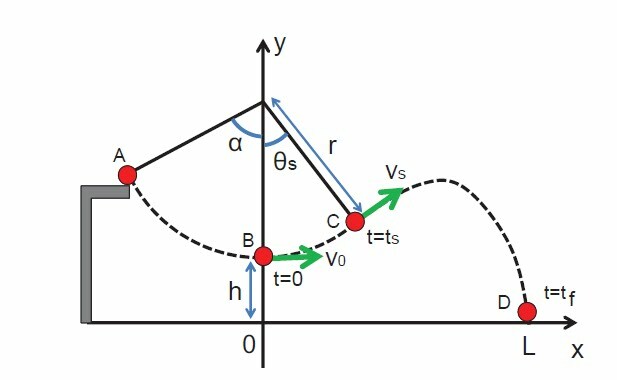 But before we jump into rope swings, let's take a step back and look at the simple case of a projectile moving without air resistance. Image courtesy of Hiroyuki Shima via his arXiv article. The first two equations above define the horizontal (x) and vertical position (y) of a projectile after a certain time, t. At the end of the projectile's motion, the y position will be 0, and the final x position can be defined as L.
For the second set of equations, we can solve for t_f (the total time of flight) on the right side. After plugging this number in to the left equation, we arrive at the final equation where the horizontal distance depends on the initial angle (theta_s), initial velocity (v_s), and the acceleration due to gravity (g). If we forget about the velocity and the acceleration due to gravity (which will stay constant near the earth's surface), how can we make L as big as possible? We need an angle that, when doubled, will equal 90 degrees because the sine of 90 degrees is 1, its maximum value. That angle, of course, is 45 degrees. Simple enough. So why doesn't this work for rope swings? Rope swing motion works more like a pendulum, so there's no single angle that leads to the biggest distance. Traveling as far as possible depends on the length of the rope and the distance between the ground and the rope when it's at rest. The equations of motion for the Tarzan case (after letting go of the rope) are shown below. And here's a diagram of the situation with all of the relevant variables listed. Following a similar process as the one we did for the simple projectile motion, Shima found the best angles for different rope swings. No matter what rope swing you use, however, the optimal angle will always be less than 45 degrees, according to Shima's calculations. But finding the sweet spot within this range depends on the height and rope length. For instance, if have a short rope that is high off the ground, you need to let go earlier because you don't need as much of a vertical boost; you're already high enough to start. If you have a long rope that's low to the ground, however, you need to let go later to attain a big enough vertical boost. Ropes with lengths comparable to their resting height will have optimal angles that fall somewhere in between. For a more detailed explanation of the best angle for letting go of the rope, take a look at Shima's paper (pdf). Shima admits that his investigation represents a simplified version of the rope swing example, and he hopes that others will account for more variables. Nonetheless, Shima's calculations should give you a rough guide suitable for a lazy day at the lake. So next time you head to a rope swing, bet your friends that you can land the farthest from the shore. With a few quick measurements, you can determine the perfect timing of your jump. All you need after that is the courage to let go. 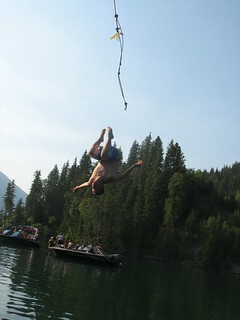 Top rope swing image courtesy of thestoke via Flickr.